Cleveland Brown's Kicker, Billy Cundiff, is doing something awesome. The story of Colleen’s Dream started in 2007 when Colleen was diagnosed with late-stage ovarian cancer. Our eyes were opened to a new world that was filled with invasive surgery, harsh chemotherapy, and lots of uncertainty. Ovarian cancer is often referred to as “the silent killer” because many women do not discover their disease until it is in the late stages, which leads to many women succumbing to the disease within a short period of time. Unlike cervical or breast cancer, ovarian cancer does not have a standardized early detection procedure. When it comes to women’s health, ovarian cancer proves to be one of the deadliest diseases. At Colleen’s Dream Foundation, we feel it is important to raise money for research that will lead to reliable early detection testing and improved treatment for ovarian cancer. Because so little is known about ovarian cancer in proportion to other women’s health issues, we have an incredible opportunity for research and education. We are working with some of the top research hospitals and universities that are researching ovarian cancer. Offering seed funding ($5,000-$10,000 grants) to young investigators, we will fund cutting-edge research by some of the brightest, young minds in the world. There may only be 4 games left in the NFL season, but that is still time to make a difference. 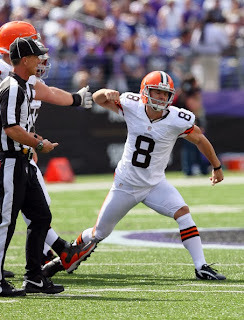 For every field goal he makes, Billy Cundiff will donate $200 and for every punt inside the 20, Spencer Lanning will donate $100, all matched by Colleen's Dream Foundation (up to $5,000), to the Cleveland Clinic. These funds will be used as seed money for young investigators by way of $5,000 and $10,000 grants. I know I don't share many details about my "real life" but I will share this one with you. I used to work for Cleveland Clinic as a fundraiser in Lerner Research Institute. I worked with some of the brightest minds in their respective fields. Imagine Big Bang Theory with white coats instead of the super hero t-shirts. I understand ovarian cancer from a very clinical, academic point of view and it is horrifying. Please don't mistake me, all cancer is horrifying, but ovarian cancer is particularly insidious. Now, here is the important part... how you can help. 1. This is super easy. CHEER. See, easy. For every field goal he kicks, Billy will make a donation. Let's hope for some Phil Awesome Dawson numbers. Same for Spencer - yell at your TV like crazy that he gets it inside the 20. 2. Follow Billy Cundiff and Colleen's Dream on the Twitter for updates. 3. Check in on the fundraising progress here. If you are so inclined, you can make a gift as well. Good thing you shared here. This type of things always boost for patients who is suffering from this. Happy to do so. Billy is doing something amazing. Awareness is the first step. Good luck to those two in making a whole load of field goals and punts.